Smart phones are not only really popular, it seems like everyone and their Grandma owns one (except me), but they are also super handy to have around. With the almost limitless number of apps available to us, these once business only phones have now become popular tools among tradesman, and can be found on every jobsite around the Country. There is one problem though, these high priced smart phones are not really designed to handle the toils of everyday construction use. My Friend and his BB phone know this all to well. After a number of short 3-foot falls, his phone was unreadable, inaudible, and functioned at only around 25%. Now I am sure many of you are more responsible with your phones, but even the most careful have accidents. What we really need are phones that are built with toughness in mind. Phones for construction workers, ranchers, or outdoors men, people that do more than just sit around all day. We need phones like... Casio's G'zOne Commando? Casio might not be the first brand that comes to mind when thinking of smart phones, but try as I might, I could not come across any other phone that matches what the Casio G'zOne line of phones offer in regard to toughness. So how tough is the G'zOne Commando? Well, it is rated for complete water immersion, driving rain, dust, falls, vibrations, humidity, -13 to 185 degree temperatures, low pressure, salt fog, and solar radiation. The only other phone that is built with toughness in mind is the Motorola Defy+, but this phone is not available in the US. 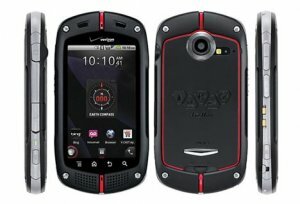 So when you buy your next smart phone are you going to go tough, or just stick with the regular models and be careful? I think I will stick with my dumb phone until it brakes, and make up my mind then.